Shades of Dr John and Eric Clapton, with hints of a full gin soaked gravel sound of Joe Cocker and with lyrics that show an emotional life, lived to the max...you have it! 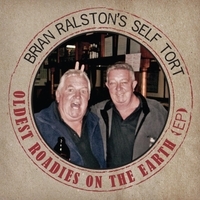 In 2000, Brian Ralston, an award winning singer songwriter, created "Self Tort" – a "modular", multi faceted band involving musicians local to places in which Brian performs. In 2013, Brian put together a band of talented musicians to enter the ABC's "Exhumed" competition (designed to find “the best bands you’ve never heard”). His entry "Oldest Roadies on the Earth" won wide acclaim and, in August, 2013, the band reached the Sydney final at the Basement in Sydney, being declared the Sydney winners. Brian has released two CDs to date: "N.I.C" in 2006 and "Tortology" in 2010. Following the success of the “Exhumed” competition, the EP "Oldest Roadies On The Earth" is now available. The CD includes the two tracks performed by the band at the Sydney final: “Oldest Roadies on the Earth” and “Mid Life Crisis” recorded by the members who performed the song at the final. In March, 2015 Brian will be releasing a new CD entitled "Stripped Bare". Brian reaches people with his beautiful musical stories about things that affect us all: life, love, and some social comment that touches the heart of the listener.